Home-Cooked & Handmade: My favorite Granny Afghan so far! Last year we went to the fair. As usual, we checked out the exhibit hall and saw all the homemade creations displayed. From jams and jellies to Lego creations and fantastical creatures constructed of vegetables, it was there. Later that night, I saw on Facebook a friend of mine had pictures of her kids holding up their entries and blue ribbons. That was awesome! I asked her how hard it was to enter and she directed me to the page for the fair entries. I read it and found out it was a cinch. So this year my kids are planning on entering. Fun! Not to be left out of all the fun, I checked out the list of options for adult exhibits. 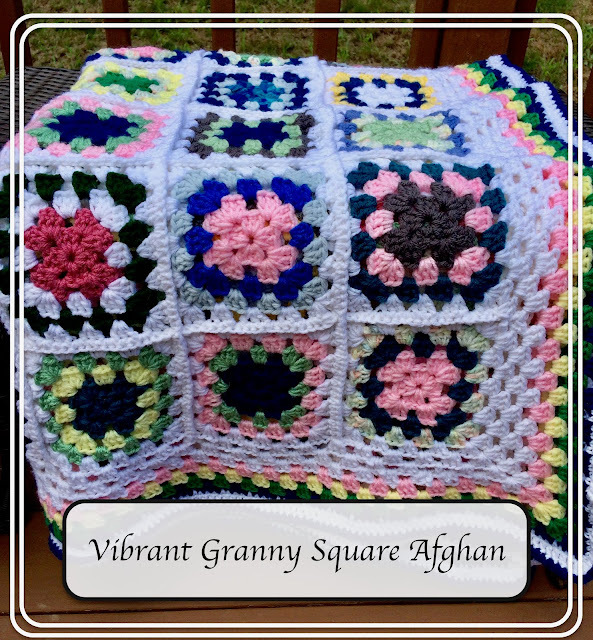 I saw granny square afghan there and I thought, perfect! So this is what I came up with to enter into the fair this year. I'm excited to see how I do and check out all the other items people enter. I'll show you what the kids made as well in another post, so stay tuned! Check out this post to see how we did!